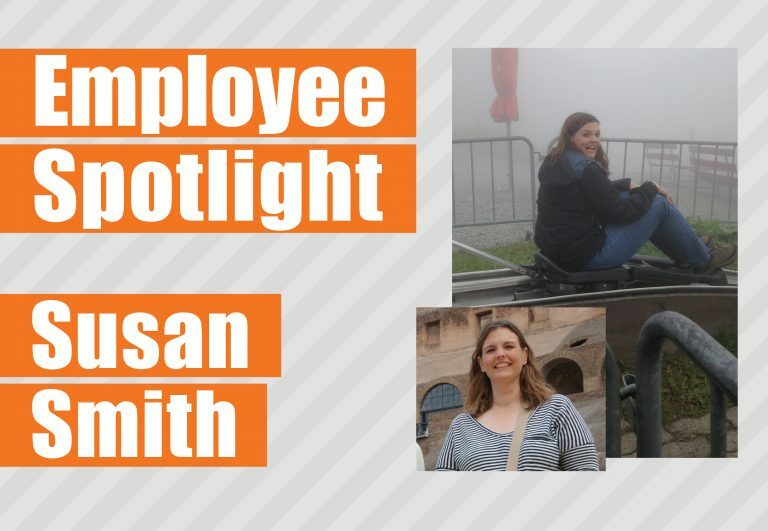 Susan Smith is the Technology Program Manager at Walsworth. She works in the Overland Park office, and 2018 marks her 26th year at Walsworth (although it could be argued she’s been here 28 years). She oversees many moving parts that affect the technology our customers use. When she’s not working, Smith enjoys travel, cooking and gardening. How did you initially come to Walsworth? The 26 years counts from when I started after college. I actually worked here for a couple of summers during college. A friend’s mother was an employee, and they would hire college kids in the summer to process orders for these Who’s New on Campus? books that Walsworth used to publish. I did that for two summers. So if you wanted to you could claim 28 years at Walsworth? I actually got a statement from Walsworth that had those two years listed. It doesn’t count toward anything, but they do acknowledge that I’ve been here a while (laughs). My title is Technology Program Manager. Basically, what that means, is I am the project manager over all of the technology projects that we do. Mainly our customer-facing technology, but also some of the technology projects that we do internally. What are some of those customer-facing programs you work on? Members Only, Online Design, School Store and our InDesign plug-ins. So pretty much every piece of technology that our yearbook customers touch, other than the main website, our team plays a role in developing and maintaining. I suspect that not everyone realizes how much is done to these programs before they’re released. Will you talk a little bit about what your team does to make them user-friendly? Yeah! Really, it’s funny. My title is Technology Program Manager, but if I had my druthers I would say it’s cat herder because I’m always trying to bring everyone together. We have an Innovation Department, which is a separate department, and they do the design and customer experience. Part of that involves my team. We have Business Analysts who work with them and come up with all of the rules like, “When you click this button, you’re taken here,” or “If you’re this type of customer, you see this.” All of that has to be documented, so those two groups work together on that. Then the Business Analysts turn around and work with the developers to take what’s been defined and actually make it happen on the web, in the plug-ins, or whatever it is we’re working on at that particular time. I also manage the Testing Department which, once something’s developed, they actually take it and make sure it adheres to all of the rules we set up early on in the process. Then, once it gets to a certain point we push it out the door. And then all along I’m reporting on progress to our Director of Technology and other management groups. I get the impression that you really like your job. What is it about the job that you like? As far as what I do right now, I think the thing I most like is planning. I’m just one of those people who, both personally and professionally, I like to make plans. Even if they don’t always come through, I get to sit down and figure out where stuff is going to fit in. It’s basically like a giant puzzle I get to put together. For some reason I find that fun. Is there anything else people should know about your Walsworth career? Well, I’ve kind of been everywhere in the Kansas City office. When I worked summers in college, there were maybe 12 people in the office. It was up to 20 by the time I came after college, and it’s grown exponentially from there. So, it’s kind of fun to look around and see the stuff that I used to do. We’ve grown so much that, for an example, when I first started my main job was Marketing Assistant. I assisted project managers, but I also did the copy writing on the side. So it’s cool now to see how much we’ve grown, and how many people are required to do all of the things that need to be done. Everything that comes out of this office is really, really awesome. Switching gears, what do you do for fun in your non-work life? I love to cook. I used to be more of a baker, but I’ve turned to more savory-type things now. I have lots of plants. I have vegetable gardens. I love the summer and I love being outside and working outside. It’s hard to say. About three years ago, I went to Europe with friends. We were there for a couple weeks and I got to visit four countries, places I’d never been before. Europe always looms large as a favorite because it’s overseas and everything is so different. We started in Edinburgh, then we went to Munich. We were in Switzerland for just a couple of days, then we went to Rome. It may have been a bit much for two weeks, but we were trying to pack in as much as we could. It was funny, the most important place was different for everyone on the trip. For me, it was Munich because I have a lot of family from Germany. It was the first time I’d been there and that was really cool. Plus, I love the food. So that was my favorite. You own a good chunk of land, right? I do. Through my family, I own about 13 acres that I plan to build a house on in a few years. Right now, I just have raised garden beds and a barn. I’m trying to plant things now so I’ll have them later, but not interfere with wherever my house ends up being. Do you plan to be really involved in the design of your house? Probably not. I have a lot of ideas, but we’ll see what is realistic. I’m ok having something that’s pre-designed so long as it meets all my needs. I want a pretty small house, but there are certain features I have to have. I want a screened-in porch and a really nice kitchen, because I spend so much time there. So I can scrimp on some things and try to do more in those areas where I know I’ll spend a lot of time. You mentioned your family. Are they still in the area? Yeah. We’re a pretty small family. My dad passed away seven years ago and that’s where my land came from. My mom lives about 15 minutes from me. She just recently built a house. She used to live on three acres and I would help her out. Now, we’ve switched. Her house is in a maintenance-provided area, but she comes and helps me with my land. She’s where my love of plants comes from and her mom was the same way. She’s helping me plan, plant and pick things out. It gives her a good outlet, since she doesn’t have a giant yard anymore.